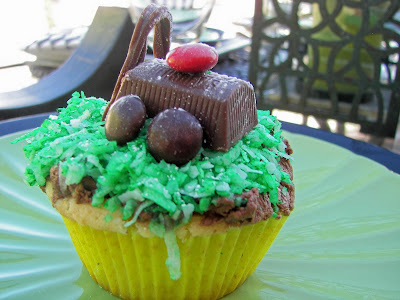 These lawnmower cupcakes are easy to make and fun to eat! When I saw them on Family Fun's Website, I knew that I would be making them around Father's Day. My husband has always liked being in the outdoors and having a nice lawn. I featured them in the Father's Day tablescape that I did yesterday for Tablescape Thursday. Bake your favorite cupcake recipe. Frost the cupcakes with chocolate frosting. Combine coconut with green food coloring and mix together until coconut is colored. Put the grass, green coconut, on top of frosted cupcake. Put Hershey Nugget on top of cupcake. 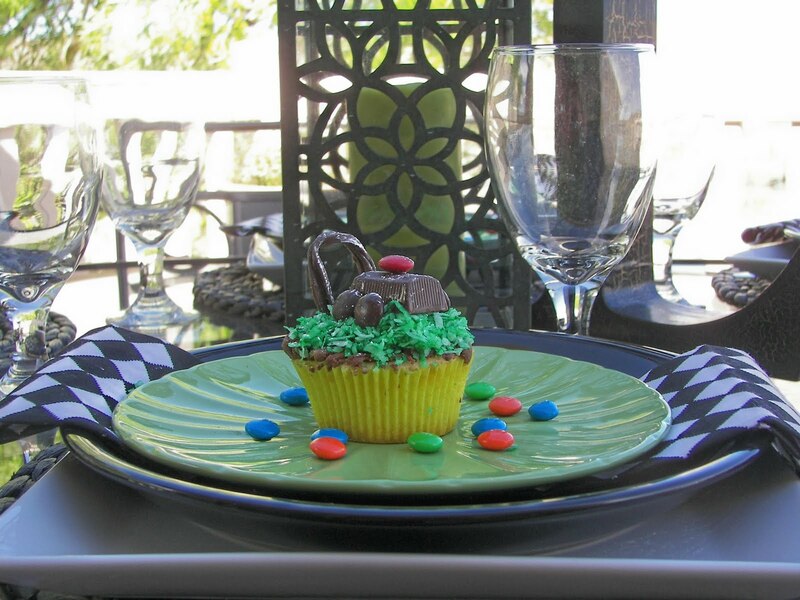 Attach brown M and M's with frosting or corn syrup for wheels. Attach red M and M on top of Hershey Nugget. Cut small piece of lace licorice for lawnmower handle. In the small town I live, I couldn't find licoric laces. If you can find licorice laces, they would look better. I used normal licorice and cut it. Stick the ends of the licorice in the cupcake. Enjoy! I am posting this with Designs By Gollum's Foodie Friday. I am also posting this with Just Something I Whipped Up Mondays and Sumo's Market Yourself Mondays, and Cupcake Tuesdays. Cute cupcakes. At least I have some friends on the web! My husband won't take me to a movie, so I have to turn to cyber friends! Oh I gotta try these!! I know my kids and hubby would love them!! Joni-These are adorable! 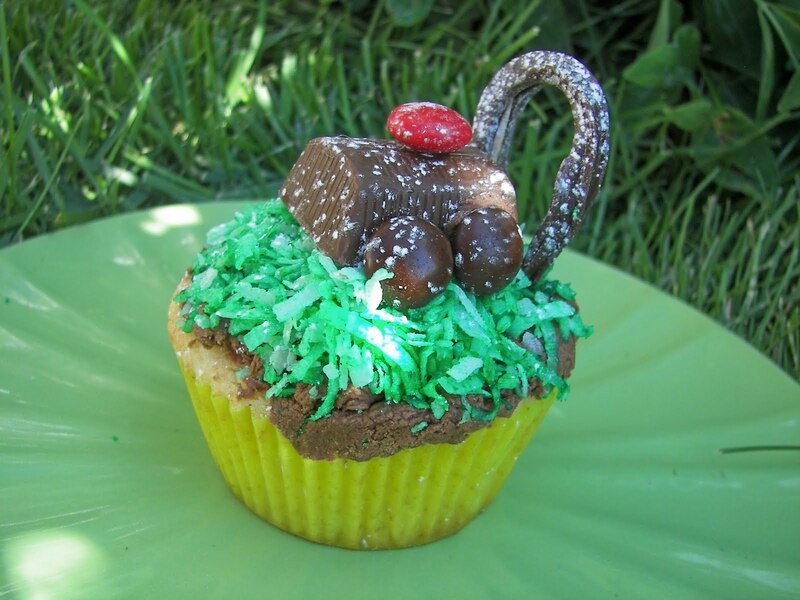 I think my husband would rather I figure out how to make "hammock cupcakes" :) I love the coconut grass! These are adorable and I would like to make these as a treat for my lawn service men who work so hard in all types of weather to keep my grass neat and trim. These are fabulous! Joyce is right-they would make great gifts for the gardeners in our lives. I must check out the Family Fun site-I haven't been there for months! How adorable! I love Family Fun Magaizine ..they always have good ideas and recipes. Super cute! Thanks so much for sharing on Cupcake Tuesday! Don't forget, you can also link up on my new blog, Its A Blog Party! I host a different linky party everyday, and Tuesday are all about food!